As with anything interior design related, the success of a project is in the planning. 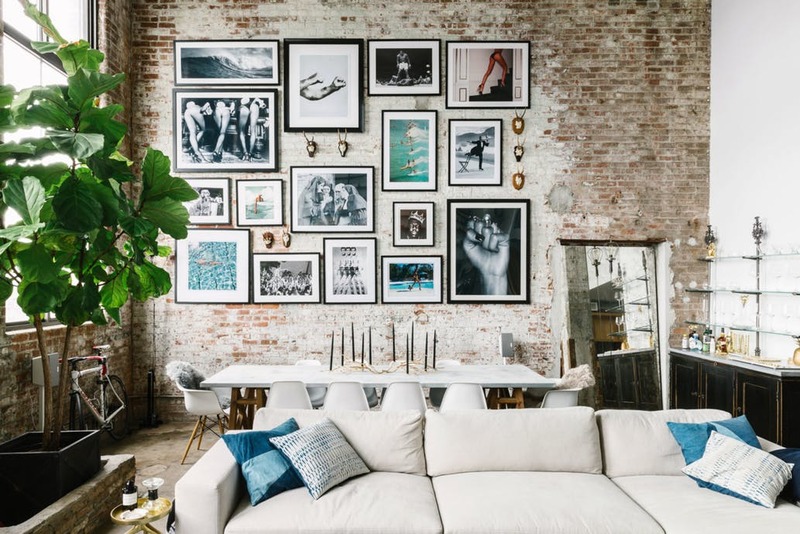 Following a few simple guidelines will help you to put together the perfect gallery wall layout to create a cohesive, fun and ultimately beautiful display. 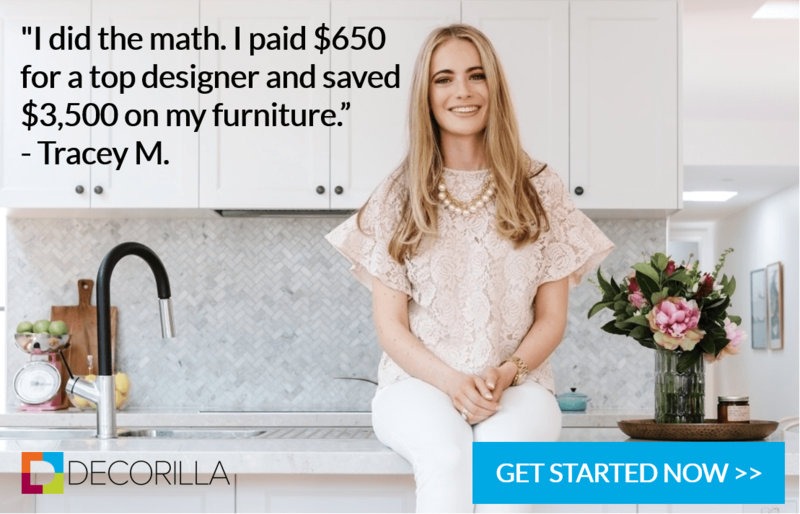 Here are some inspired gallery wall ideas and tips from the Decorilla Design team to help you get started on your own. Let’s first look at 7 Basic Gallery Wall Layouts. Straight, clean lines are sure to soothe the souls of those who value order and predictability. The rhythm creates a more formal look that works equally well in a modern or more traditional room. 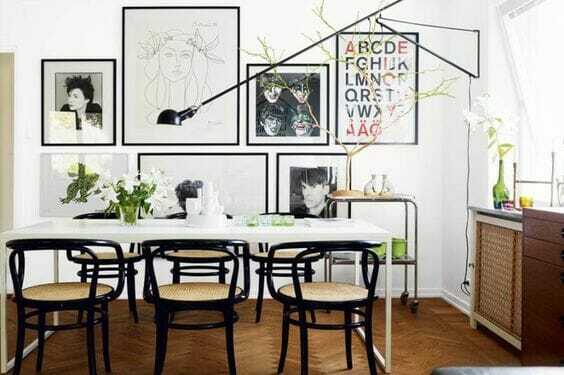 The success of this layout lies in the careful hanging of the artwork to ensure perfect spacing. All artwork is arranged so that the outline creates a square or a rectangle. This requires careful planning, and it’s also tricky building on such a collection as a single new piece will compromise the layout. This arrangement has a definitive line at the top that naturally leads the eye, making sure every piece is visited on the way. The inverse of the top aligned gallery wall layout, this gallery wall ends in a solid horizontal line, creating a place for the eye to rest. A well-balanced arrangement, offering the most freedom when wanting to build on the collection in future. This layout can expand either to the top or the bottom while maintaining the constant horizontal or vertical line as the starting point. If your space on one wall is limited, take the layout onto an adjacent wall! This works especially well in smaller rooms. 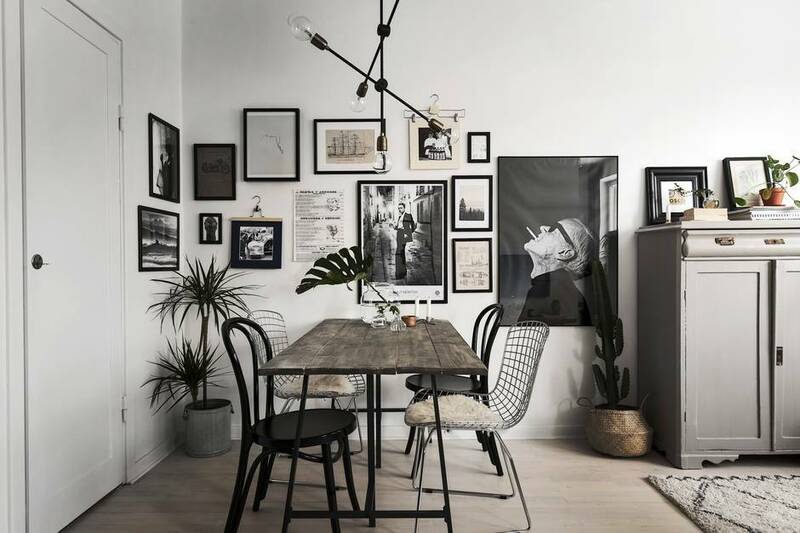 This is a trendy gallery wall layout, but just like the symmetrical layout, this arrangement is deceivingly challenging to achieve. It has the appearance of being a spontaneous, thrown together collection of artworks, but it looks good because of the careful planning that goes into arranging the pieces. For a successful random layout, ensure that vertical or horizontal midlines of pieces line up to adjacent artwork or that the collection centers around one piece. 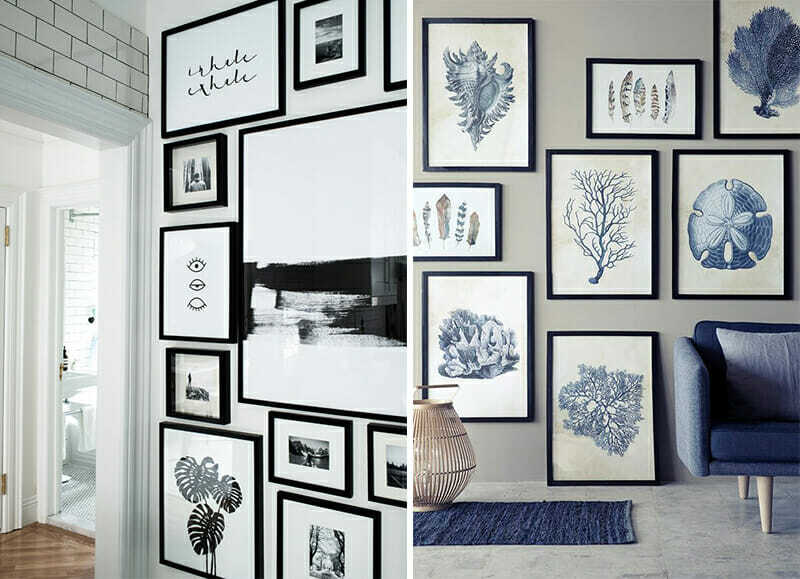 A gallery wall can be made up of photos, artwork, mirrors, prints, or anything else really that makes you happy. Putting these items together so that they work together, may, however, pose a challenge. Cozy bedroom by Decorilla designer, Teri C.
Here, anything goes. 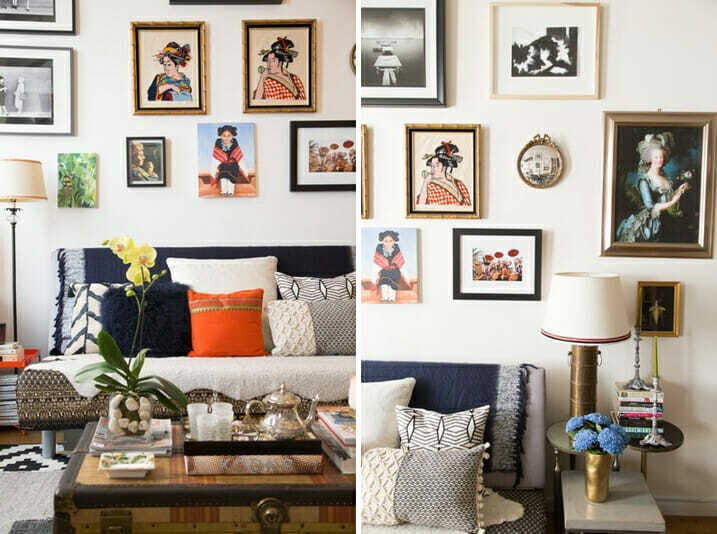 Although this makes it easy and fun, this type of gallery wall can easily look messy without the direction of a layout plan. 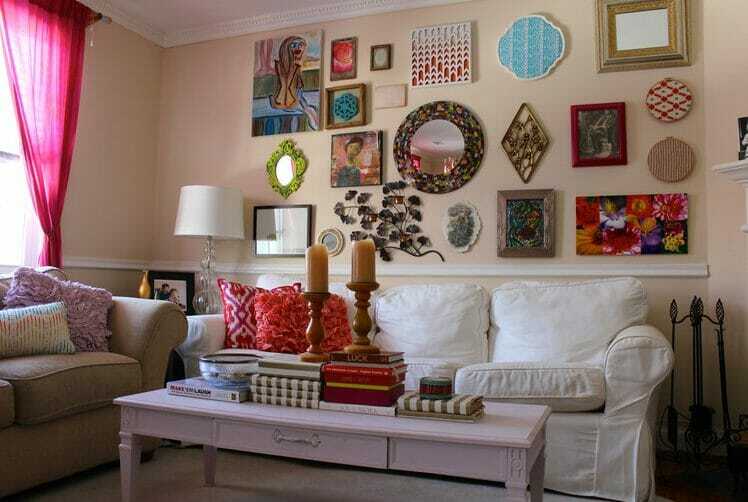 Make newspaper cutouts of all the items and arrange them on the wall using painters tape. This will allow you to play around with the various options before you commit any nails to the wall. 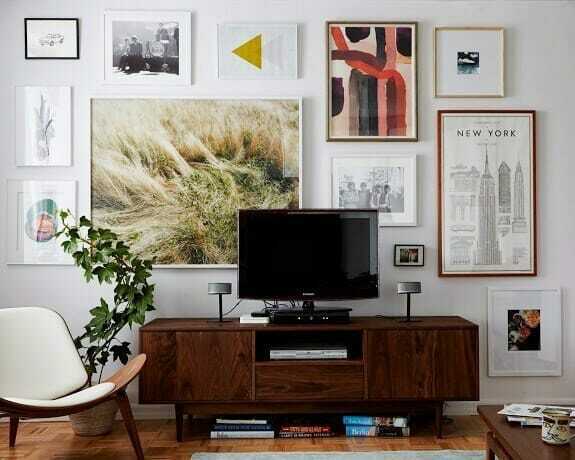 Pro Tip: Remember that you can also successfully incorporate your television into your layout for a truly multi-media gallery wall! 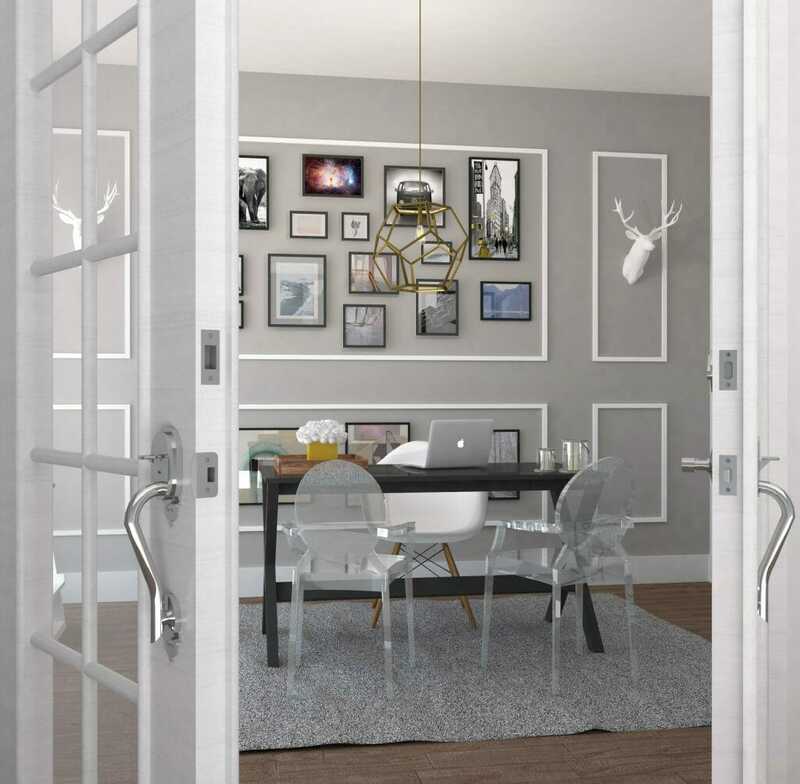 Get a cohesive look by using artwork, prints or photos in similar tones. You can keep them all in similar sized frames for a block layout, or vary the frames and sizes to achieve a random look. Cozy bedroom by Decorilla designer, Peti L.
Create a gallery wall where all the pieces are linked to each other through their theme. This could be artwork centered around a subject, like flowers, or a style like this beautiful Asian-inspired wall by Decorilla designer Peti L.
An interactive gallery wall is great for kids’ rooms or playrooms, and it can also work very well in a practical area like a classroom or home office. Another fun gallery wall idea is to put a chalkboard frame among the other artworks and invite guests and family members to leave notes or doodles. 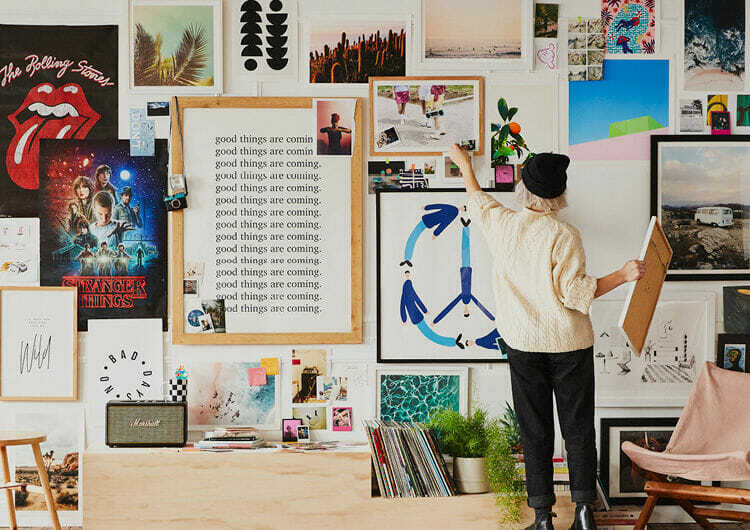 Browse around for some more fun gallery wall ideas before making the final decision on your masterpiece. 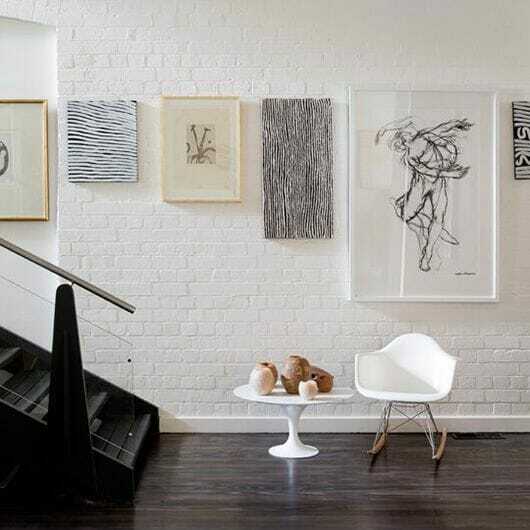 Gallery walls don’t only have to be made up of artwork! 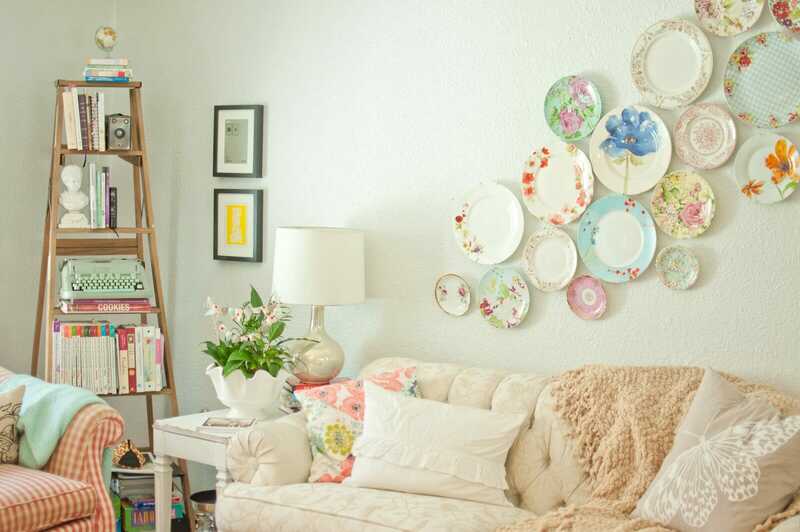 You can also create a beautiful display using your prized plate collection. 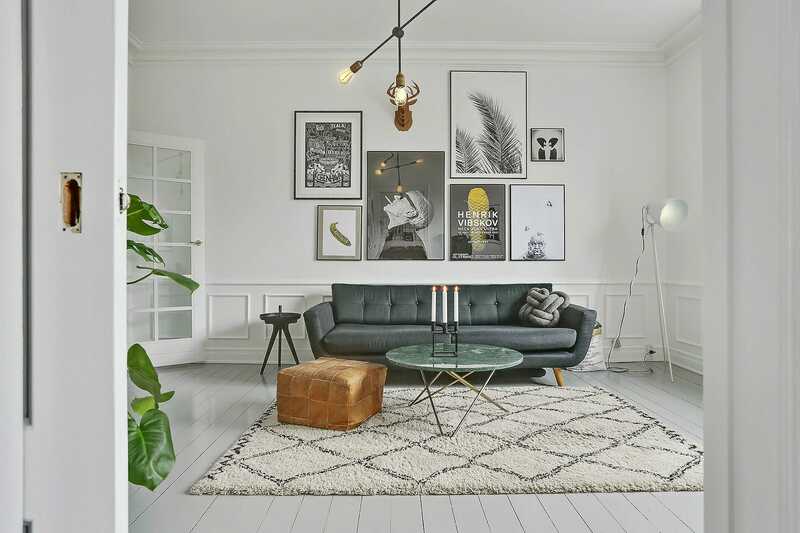 For more ideas, have a look at these gorgeous and inspiring gallery walls. 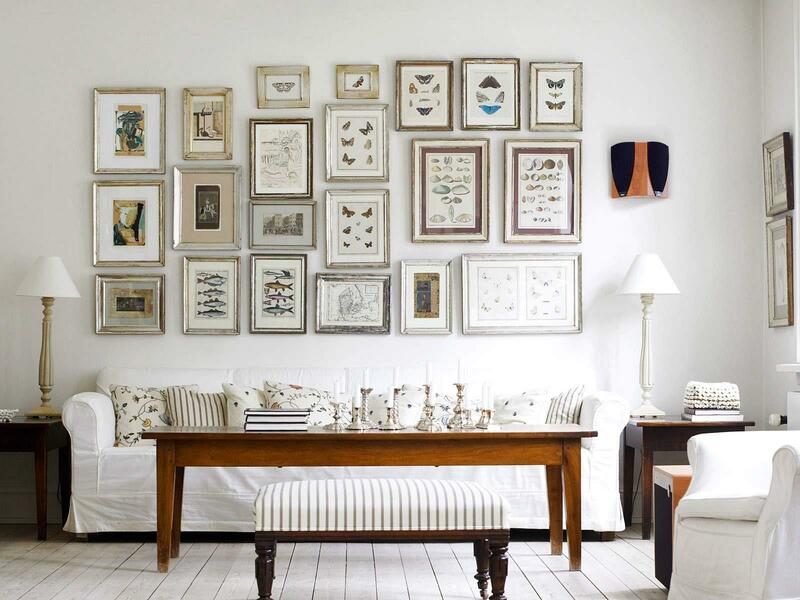 Keep all your artworks evenly spaced and try to keep the middle line of the collection at eye level. Use some paper cut-outs with the same dimensions as your artworks to plan the layout on the wall or just place all your pieces on the floor to see how they interact with each other. Pay attention to the direction of the subject in your artworks ad always try to lead the eye back towards the center of the gallery wall. Measure twice, hammer once. Enough said. 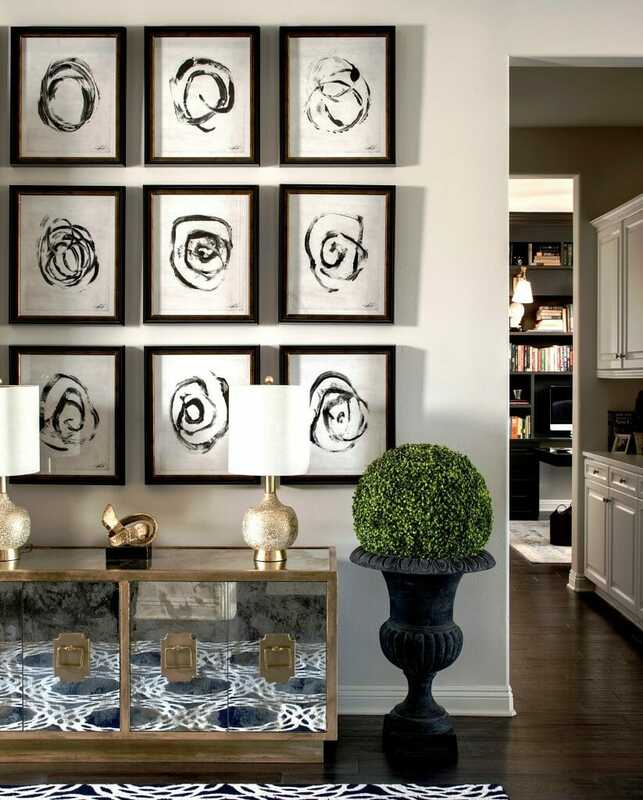 Once you have an idea of what you’d like to put on display, follow our guidelines to make your own gallery wall or schedule a free consultation with one of our online interior designers today and chat about how you can create a beautiful and memory-filled gallery wall in your home.